This Red Roof in Houston North - FM1960 & I-45 keeps you close to the biggest events happening in downtown Houston. Families will love discovering life underwater at Houston Downtown Aquarium and zipping down the thrilling water slides at Wet n Wild SplashTown. Shop til you drop at The Woodlands Mall and practice your swing at Cypresswood Golf Club. Feeling adventurous? Get on horseback at Cypress Trails Equestrian Center and put your skills to the test on the rock walls at inSPIRE Rock Indoor Climbing & Team Building Center. Stroll along the scenic trails at Dennis Johnston Park and Pundt Park, then wander through the floral landscapes at Mercer Botanic Gardens. End your evening with a live performance at The Hobby Center for the Performing Arts or a feature film at AMC Spring 10. We are also close to the flights at George Bush Intercontinental Airport (IAH) as well as a variety of dining options nearby, several with walking distance. After a day of nearby exploration, unwind at our family-friendly hotel. Sign on to our free Wi-Fi and watch your favorite shows with our free expanded cable package. You will find plenty of outlets around your room so that you can charge all of your smart devices. Go for a swim in our seasonal outdoor swimming pool or wash a load of laundry in our guest coin laundry facility. Stop by our lobby for a complimentary cup of hot coffee or tea, then purchase a snack from our snack center. One well-behaved pet per room is welcome at Red Roof Inn Houston North - FM1960 & I-45. This Red Roof in Houston North - FM1960 & I-45 keeps you close to the biggest events happening in downtown Houston. Families will love discovering life underwater at Houston Downtown Aquarium and zipping down the thrilling water slides at Wet n Wild SplashTown. Shop til you drop at The Woodlands Mall and practice your swing at Cypresswood Golf Club. Feeling adventurous? Get on horseback at Cypress Trails Equestrian Center and put your skills to the test on the rock walls at inSPIRE Rock Indoor Climbing & Team Building Center. Stroll along the scenic trails at Dennis Johnston Park and Pundt Park, then wander through the floral landscapes at Mercer Botanic Gardens. End your evening with a live performance at The Hobby Center for the Performing Arts or a feature film at AMC Spring 10. 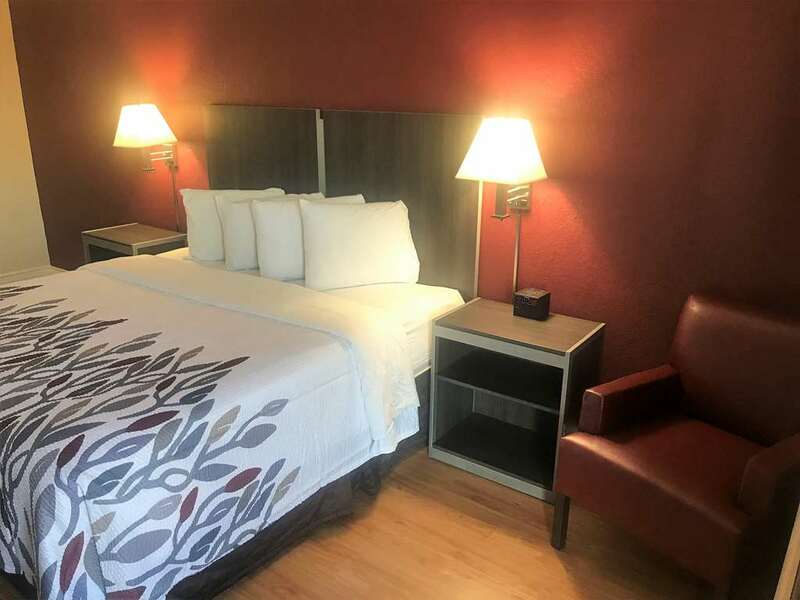 We are also close to the flights at George Bush Intercontinental Airport (IAH) as well as a variety of dining options nearby, several with walking distance.